Join David Minkin, International Champion of Magic, for an intimate evening of world-class magical artistry. 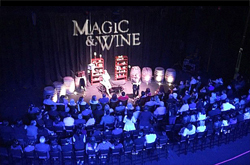 The event takes place at the beautiful Majestic Garden Hotel for a 90-minute close-up magic performance by one of the world's premier close-up magicians. Seating is limited to 100 guests to maintain an intimate experience. Please note: No cameras/audio/video or ticket refunds. AGE: This event not recommended for children under 7. Guests under 21 will not be served alcohol. ARRIVAL TIME: Please arrive 1 hour after the listed event start time, since other guests will be enjoying an hour of wine tasting prior to the show. This ticket is for the show only so you may join the group as they move into the theater for the second hour. For example: If the Magic and Wine start time is 7:30 PM on a given day, you would arrive a few minutes before 8:30 PM for the show only.